Fishery Research Vessel 7417 "Baía Farta"
Home › Research Vessel › Fishery Research Vessel › Fishery Research Vessel 7417 › Fishery Research Vessel 7417 "Baía Farta"
Damen Shipyards Galati has made provisional delivery of the 74-metre Fishery Research Vessel Baía Farta to the Angolan Ministry of Fisheries. 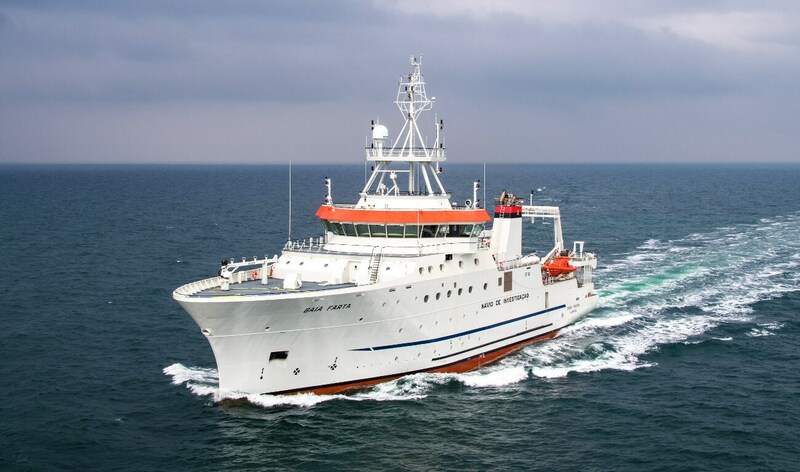 The Damen FRV 7417 Baía Farta is equipped for the full range of fisheries research and assessment activities including hydrographic operations, acoustics research, pelagic and demersal trawling, plankton, water, environmental and geographical sampling, oil recovery and emergency towage operations. To maximise her effectiveness in her role, the Baía Farta has been built to Silent-A/F/R Class notation standards. Every care has been taken in her design, construction and outfitting to minimise underwater noise as well as onboard internal acoustic noise and vibration.